I make my living as an actor. 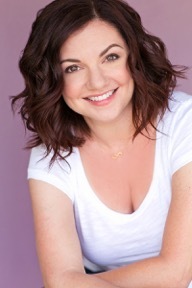 I like hiking, books, vodka, and going to Italy, and I love my husband, daughter, and dog. If you laugh at my jokes, we’ll probably be fast friends. If you make me laugh, we’ll probably be best friends. Sometimes I’m on TV, but mostly I’m behind a microphone. Celiac and Gluten Free since 2002, I began this blog to recreate gluten free versions of comfort food favorites from my half Italian, half Southern-girl heritage. In 2012, I partnered with the inimitable Vinnie Tortorich to co-host and produce The Angriest Trainer Podcast, and my recipes these days are mostly free from sugars and grains—the Vinnie term is NSNG—No Sugars No Grains. I use fresh ingredients whenever possible, and I keep things simple. Though I avoid sugars and grains 95% of the time, I’m not a machine. I have a heart and hormones like any other lass. There are lots of gluten free sweets on this blog because I believe that if you are gonna treat yourself, do it right by doing it from scratch. 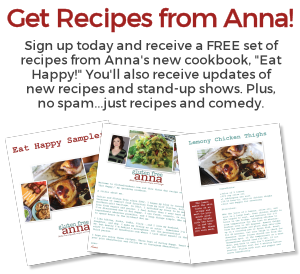 I recently published the Eat Happy Cookbook and I hope you enjoy every tasty recipe from cover to cover. 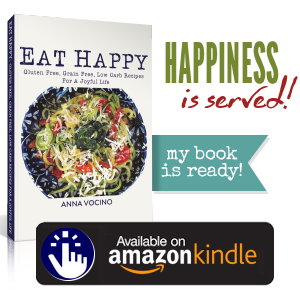 Click here to learn more about the Eat Happy Cookbook! Sometimes I’ll review products I’ve purchased or have been given to me, but I will never endorse a product just ’cause they pay me. There is no conflict of interest to be found within these pages. It’s just the personal viewpoint of a very opinionated GF loudmouth, and I hope you enjoy your time here.